A Spinal Disc is our natural "cushion" or "shock absorber" between the Vertebrae. 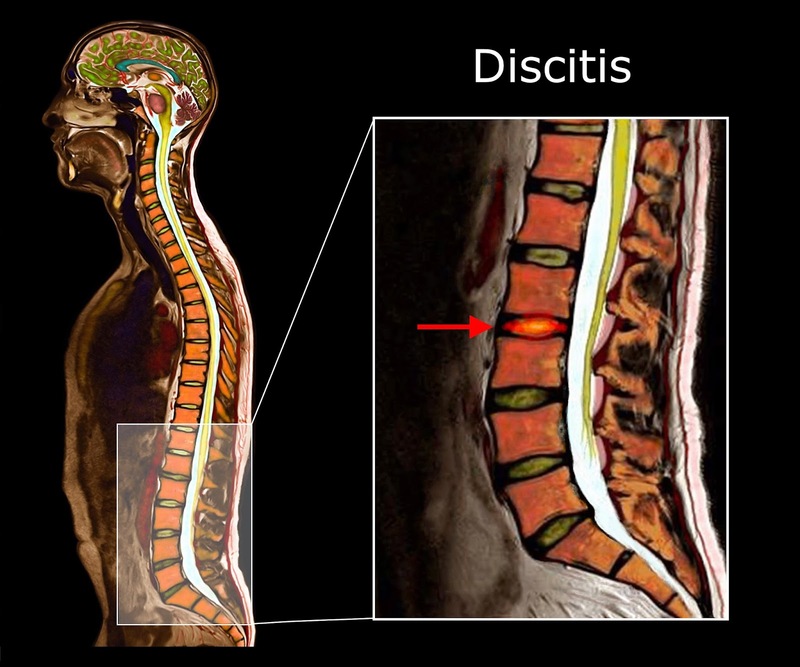 Discitis is a bacterial infection of the Spinal Disc. Why do Discs get infected? The spinal disc is a structure with very little blood supply. Most of the blood vessels are found on the outer layer of the disc (annulus fibrosus), but rarely deeper than that. The core of the disc (nucleus pulposus) usually does not have blood vessels at all. It is the largest such space in the human body without any blood vessels. This can lead to problems such as infection. Normally, blood vessels are useful in preventing or treating infections. The body uses blood vessels to send cells to treat or prevent infection. In the case of the spinal disc, not enough blood vessels are present to carry out this function. If bacteria enter the disc, they can often multiply and become a serious infection. Who is at risk to develop Discitis? Children under the age of 8. Some children get discitis for no particular reason other than perhaps having an immature immune system. Patients with a severe urinary tract infection (UTI) or respiratory infection. What are some of the common symptoms of Discitis? Patients often experience severe low-back pain and are often quite debilitated. Any activity involving the low-back can cause severe pain and spasticity. How do Spine Specialists diagnose Discitis? A history of having severe low-back pain, fevers, chills and sweats is suggestive of discitis. Having an infection in another part of the body or recent spine surgery can make it more likely to have this diagnosis. Patients with discitis may appear ill in the later stage of the disease but may appear otherwise normal early on. Pain with pressure on the spine can be very severe, more so than one would expect compared to other spine conditions. Patients may also refuse to move and prefer to lie down to rest their spine. The vital signs may show a rapid pulse, fast breathing, as well as the presence of a fever. Spine images can often help make the diagnosis of a lumbar discitis. Plain X-Rays may be normal unless the infection involves a vertebra next to the disc and begins a destructive process. Sometimes a small amount of air can be seen in the space occupied by the disc which could suggest infection. MRI scans with intravenous contrast (dye) are usually the study of choice. The disc will often change color and show swelling around it. If the infection has spread to the vertebrae, this can also be verified by the MRI scan. Sometimes an abscess (collection of bacteria) in a space next to the disc can be seen as well (epidural abscess). CT scans are not very good at showing the disc itself, but like plain X-Rays can show signs suggesting infection. They can show if the bone of the vertebrae next to the disc is infected. Bone scans can show discitis in a very obvious way, but are not typically the study of choice, since the details of the spinal anatomy cannot be seen clearly. A biopsy of the disc can confirm the diagnosis and find the organism (bacteria). However this is not routinely done to avoid spreading the infection at the time of the needle placement or removal. What is the treatment of Discitis? The primary treatment of discitis is the use of intravenous antibiotics. Potent antibiotics are often given for long periods of time (up to 6 weeks or more). A brace may help by adding stability to the spine and limit the painful motion at the infected segment of the spine. PT can help keep the patient as mobile as possible to avoid loss of muscle mass. It may also be helpful to mobilize a patient. Surgery is rarely needed for Discitis. Exceptions are the presence of a severe involvement of the vertebrae next to the disc (osteomyelitis), potentially causing them to collapse. In this case the vertebrae may have to be partially removed and a metal cage inserted. This is called a Lumbar Vertebrectomy/Corpectomy. Here is a Video about Color X-Ray, CT, and MRI Images by Medical Media Images. This disease was first observed by the Danish physician, Holger Scheuermann. He was an Orthopaedic Surgeon and Radiologist in the early 1900’s. The disease is a childhood disorder of the development of the mid-back (thoracic spine). The vertebrae grow unevenly and become "wedge shaped" rather than square. The reason is that the front of the vertebral body grows slower than the back. This results in the characteristic "wedge" or "pie" shaped vertebral bodies. The wedge shaped vertebrae cause a forward curvature of the mid-back) thoracic spine, called a “kyphosis”. The most affected vertebrae are T7 and T10. Males are more commonly affected than females. At what age does Scheuermann’s Disease start? This disease often becomes apparent in the early teens. It can progress until the bones of the spine are fully grown. During that time, the disease can progress and a hunched mid-back appears. The patient cannot straighten the spine completely. This disease stops to progress once our bones have stopped growing. 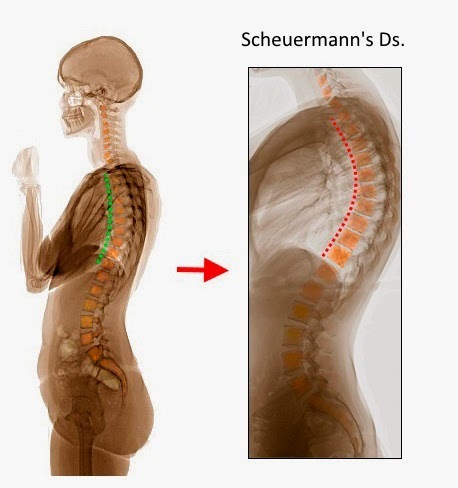 The diagnosis of Scheuermann’s disease is primarily made with X-Rays: The normal spinal curvature in the mid-back is 20-50 degrees forward. 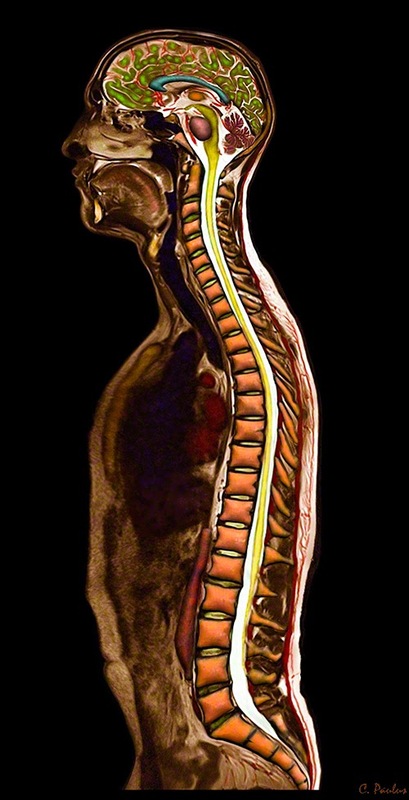 A curvature of more than 50 degrees with 5 wedged vertebrae in a row is diagnosed as Scheuermann’s disease. 2. 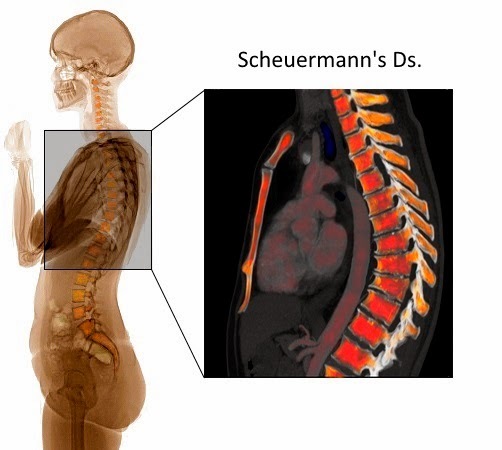 A CT Scan can show more details of Scheuermann's Ds, but is typically not needed. 3. MRI scans can also show Scheuermann’s disease, but may not be necessary. During the teenage years a specific brace (Milwaukee Brace) can be used to treat the curvature in the spine. Strengthening and hamstring exercises can be helpful. PT can offer spine exercises, manual therapy, electrical muscle stimulation, aquatics, amongst others to help treat the symptoms of this disease. Massage therapy can help with the muscle pain from the abnormal spine curvature. Surgery can be used to treat severe cases of Scheuermann’s disease. most commonly in the form of a Thoracic Osteotomy and Fusion. This surgery attempts to make the Vertebrae square shaped by removing bone from the back of the Vertebra. Following that, the Spine is fused to keep in the new, straighter form. Here is a Video about Color X-Ray, CT, and MRI Images from Medical Media Images. A Vertebral Compression Fracture (VCF) is a collapse of a vertebra in the spine. Typically, the main body of the vertebra collapses, rather than other, smaller parts of a vertebra. Since the collapse of the vertebra is in the front portion of the vertebra, the spine often begins to curve forward. Why do patients get a Vertebral Compression Fracture? VCF’s are caused by too much pressure on the front of the vertebrae, which is the vertebral body. This happens when the spine is bent forward (flexed) too far, or too much weight is placed on the spine. This causes the vertebral body to collapse in a wedge or "pie" shape (smaller in front than back). Less common is a burst fracture, where the vertebrae breaks off into pieces, some of which could cause compression of the spinal cord or spinal nerves. While osteoporosis (bone thinning) related VCF’s are the most common, they can also occur due to trauma or bone cancer. 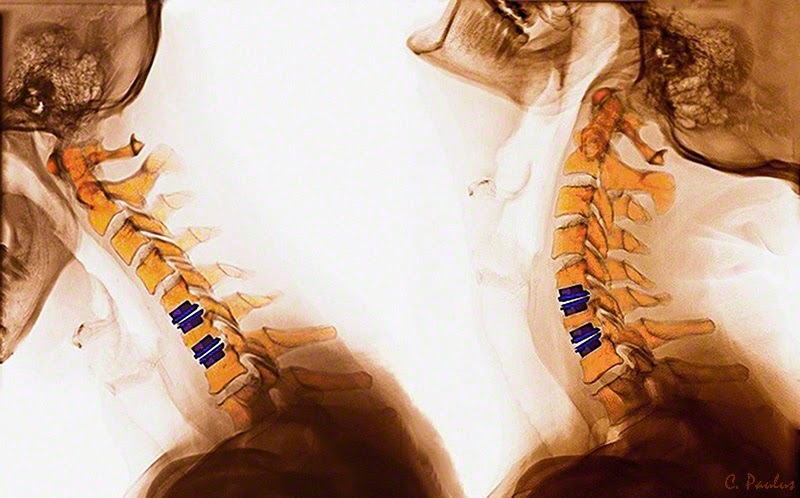 How common are Vertebral Compression Fractures (VCF)? Where in the spine do Vertebral Compression Fractures usually occur? VCF’s most commonly occur in the mid-back (thoracic spine), and low-back (lumbar spine).The most common spinal levels affected are T7, T8, T12 and L1. This depends on the reason for the fracture. Fractures related to trauma and osteoporosis tend to heal within 6-8 weeks. Fractures related to cancer may not heal completely. 3. Worsened pain with standing, sitting or walking, improved when lying down. It is estimated that only 1/3rd of VCF’s are diagnosed. Part of the reason is that many VCF’s can cause very little or no pain at all. A history of a sudden onset of back pain especially in patient with known or suspected Osteoporosis can be a tip off for a VCF. X-Rays of the spine can show the common “wedge fractures” seen in VCFs. Here is a Color X-Ray showing a mid-back (thoracic) VCF. This Image is Interactive. Just move your mouse cursor over the Image to learn more (if the interactive tags do not load properly due to low browser speeds just refresh the page). the radiation does from CT scans high. Here is a Color CT Scan which is also Interactive. Alternative health options can complement traditional medicine. Massage Therapy, Acupuncture, Meditation exercises and Herbal Remedies can all help with the pain from compression fractures. Chiropractic care in the form of manipulation is generally not advisable for a compression fracture of the spine. Spine exercises are generally not recommended for a recent compression fracture. Once the fracture is healed, gentle spine exercises can help with some of the residual muscle pain. Typically it is recommended to limit bending, twisting, lifting, and any other higher impact activity such as running. Some gentle PT interventions such as Ultrasound Treatments can alleviate some of the muscle pain from a VCF. PT can help mobilize patients who are suffering from the pain related to a VCF. Back Braces can help with the pain from the fracture and provide some stability while the fracture heals. A spine surgeon can recommend the proper brace if it is advisable. Here are some of medications which can help relieve pain from VCFs. 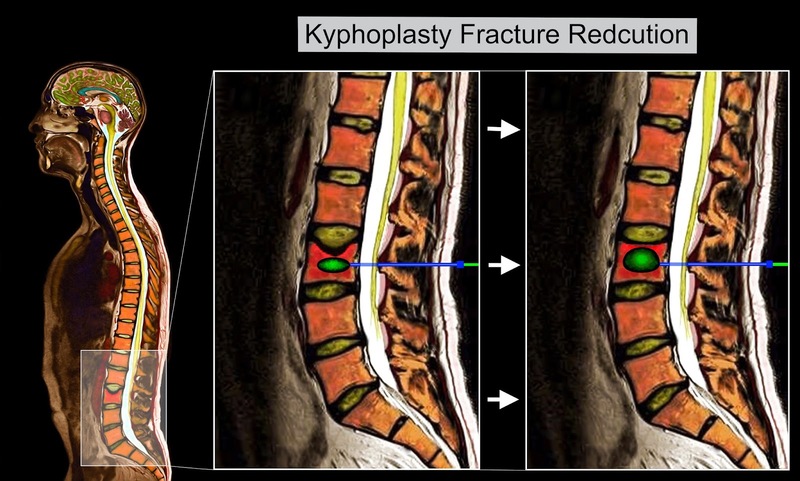 Minimally invasive treatment options such as a Vertebroplasty or Kyphoplasty can help with the pain and instability of the vertebra from VCF’s. Here is a Color MRI of a Kyphoplasty. This Image is Interactive. Surgical treatments for VCFs are generally only recommended for those resulting from trauma or cancer. An exception would be a complicated VCF related to Osteoporosis (burst fracture) which is creating pressure on the spinal cord or spinal nerves. Here is a Video about how Medical Media Images produces Color X-Ray, CT , and MRI Images. The Islamic State of Iraq and Syria, or "ISIS" made what will prove to be a fatal mistake by publicly executing James Foley, a U.S. journalist captured in Syria in 2012. ISIS's claim to have established a caliphate, or radical Islamic State, may have seemed laughable at first. However, having claimed large swathe of Syrian and Iraqi territory made it somewhat believable. Clad in menacing looking black robes, flying pirate like black flags and marching in two by two formations through captured villages, made for good photo ops and propaganda, important recruiting tools for a terrorist organization in need of young blood. Depleting banks in Mosul of billions of Dollars in cash has given ISIS the unusual capability to purchase influence and weapons. 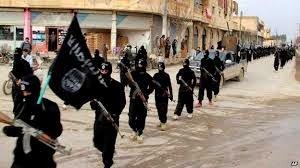 ISIS has de facto become an employer to large numbers of Iraqi and Syrian villagers by providing paid jobs and subsidizing businesses. This is a far more dangerous success than any weapon on the battlefield can currently provide. However, the access to large quantities of cash will also provide access to far more sophisticated weapons like surface to air missiles, aircraft and dirty bombs. Much of ISIS's early success came by flying under the International Media Radar and therefore out of the public eye. This changed when ISIS captured Mosul and made quick gains toward Baghdad. However, the Media attention waned again until ISIS began to persecute and displace Christians and Yazidis in an aggressive effort to cleanse their self declared Caliphate of non-Muslims. By putting the Yazidi cause front and center before the public, the Media eventually forced a more than reluctant Administration into a very limited military role. While President Obama seems to declare success and victory at the first sign of any positive developments against ISIS, the reality is that until now it has been too little and seemingly too late. 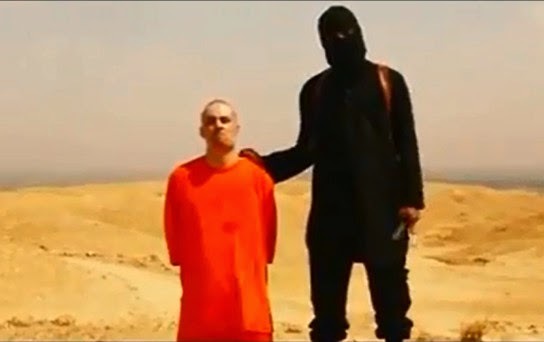 In comes the gruesome, public execution of James Foley, a journalist who's only fault was his nationality. This is a classic example of acting on rage, without understanding the consequences and more importantly, your enemy. While the U.S. has a long and bloody history of misunderstand other cultures, the beheading of James Foley is a glaring example that this is also the case with ISIS. Taking on the U.S. Government will only yield action if it is in the geo-economic-political interest of the Administration. The main exception to this general rule are situations where the mounting pressure of public opinion and general outrage forces the hand into action. Inaction in this situation can be costly in terms of reelection votes, the most treasured of all commodities. So, what was ISIS's fatal mistake? Taking on the International Media. From here on out, the Media will keep ISIS in the headlines. Any atrocity committed by ISIS which may have received little attention in the past, will now be broadcast in detail. Journalists will go to great length to write compelling stories mixed with graphic Images to bring ISIS to our living rooms. ISIS will no longer fly under the radar. An Administration who would love nothing more than living out its current term without any further conflicts, will be forced into a broader, more sustained multi-national effort to contain ISIS. ISIS was far more dangerous before they attacked religious minorities. They had cash, military success, captured territory, and a growing following of local and international recruits. With time, they could have consolidated their territory, created an organized, very well equipped army and controlled precious resources. James Foley's tragic and cruel death may have saved the live of many others. ISIS was on its way to hold us all hostage. Now, the media coverage will not stop until ISIS is contained. While it may take many months to achieve, this is the beginning of the end for ISIS.